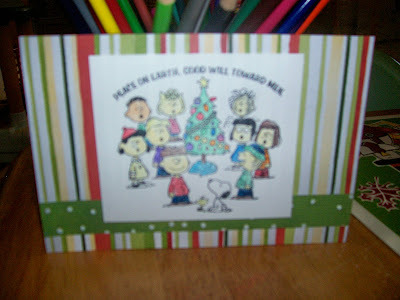 Confessions of a 20-something Scrapbooking Mother: Charlie Brown Christmas for Angel's sketch #15! Here is my take on Angel's sketch #15. I had to tweak it a bit because my image is fairly large, but here it is! Do you love that stamp or what?? I'm doing all my Christmas cards with it this year. I normally try to do them different, but I'm in a time crunch, so this will be my card! Cute stamp and card! Thanks for playing! I love the Peanuts gang! I love that Peanuts classic cartoon! When Linus gives his speech, it gets me every time. It's perfect! This is a GREAT card, and I love it!! Love peanuts that s why my dog's name is snoopy too cute !